FL Studio has definitely upgraded the Patcher Plugin for version 11 with the Control Surface and Mapping GUI. The Control Surface let’s you create your own controls for all of the plug-ins housed inside of Patcher, including the ability to control some complicated (advanced) routing of signals and multiple controls. Using Fruity Formula Controller and Fruity Send creatively, you can do some pretty cool routing to have one knob, slider, or XY in the Control Surface incrementally control numerous events, effects and sounds. The Fruity Formula Controller can be used to control ranges of values for certain parameters rather than a complete 1:1 correspondence with knobs and sliders if you were to directly link from the Surface Control to a parameter. In combination with Fruity Formula Controller, Fruity Send can be used as a routing switch. The first thing we should do is create the knob that will control several parameters. For purposes of this tutorial we will keep it to one knob, but once you get the concept down on how to manipulate Patcher using Fruity Formula Controller and Fruity Send, you’ll be able to do control whatever parameters you want in more complex ways. You can rename it (which is good practice when using more than one knob, slider, or xy controller). Click on the “Surface” tab in Patcher, then hit the “+” button to select “Knob”, and hit the “E” button t change the color and size (and also rename). Now that we have our knob, go to the “Map” tab to get the overview of your Patcher preset and routing. You’ll notice that the Surface icon has a red circle on the right – this is the link to our knob we created. Now we can add a sound generating Virtual Instrument to the preset by right clicking -> selecting “Add plugin” -> selecting an instrument under “Generators”. In the example below I selected “Harmor”. You can do this with any parameter, but this one will affect the speed of the filter envelope’s loop. Click back to the “Map” tab, and you’ll see that there is now a red circle to the left of the Harmor icon – this is the “Decay” knob control. Now right click on the map and select “Add Plugin” then under “Effects” choose “Fruity Formula Controller”. Hit the “Editors” tab in Patcher and go down to the Fruity Formula Controller GUI. There you will be able to enter a formula, “a+c*(b-a)”, that allows you to define the minimum (starting point) and maximum (end point) percentage values for the range of the knob in the Surface and how much it moves the “Decay” knob in Harmor. 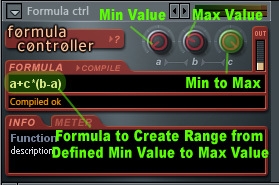 If the value of “a” in Fruity Formula Controller is less than the value of “b”, then the “Decay” knob in Harmor will move clockwise. If the value of “a” is more than “b”, then the “Decay” knob will move counter-clockwise. Make sure to hit “Compile” on the Fruity Formula Controller to activate the formula. 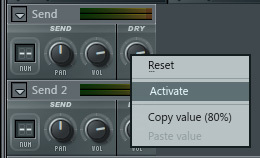 Now you should be able to play a note and adjust the knob in surface to affect the Speed of the Filter 1 Envelope Loop in Harmor (this should create some type of wobble sound if you used an envelope like the one above). You can then go into the Fruity Formula Controller and adjust the positions of the “a” and “b” knob to find a nice range for the speed of the envelope loop. So far we’ve created an interesting control for one parameter in Harmor, but lets say we want to make the sound morph as the speed of the Envelope is altered. We can do this by adding more instances of Fruity Formula Controller and linking those to chains after Harmor outputs its sound. 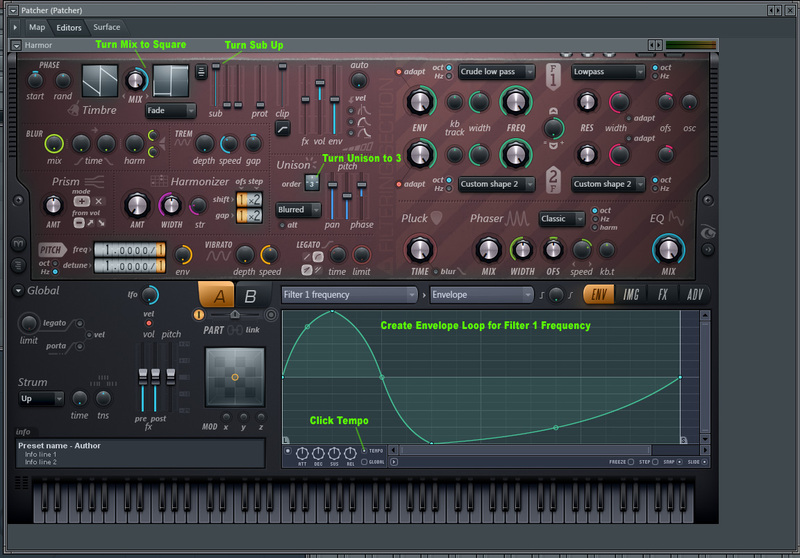 First, lets create two chains of from Harmor sound output. The first chain starts with adding these plugins: Fruity Send, Effector, and Fruity Reverb (or Fruity Reverb 2) and then linking the sound through them. The second chain is just an instance of Fruity Send between Harmor and the Main Output. The map should look like this now. Now add two more instances of Fruity Formula Controller to the Map. These are going to control which route(s) the signal from Harmor goes through before being sent to the main output (i.e., they are going to have inverse values with respect to the “a” and “b” knobs). Hit the Editors tab and go down to the Fruity Formula Controllers. 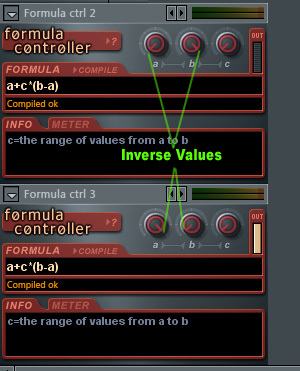 Using the same formula as the first instance of Fruity Formula Controller (the one that is routed to control the “Decay” knob in Harmor), “a+c*(b-a)”, we will be able to morph the sound from going through the effects only to going through no effects, by making sure that these two instances contain inverse values for the “a” and “b” knobs. Now activate the “Dry” knob in each instance of Fruity Send. 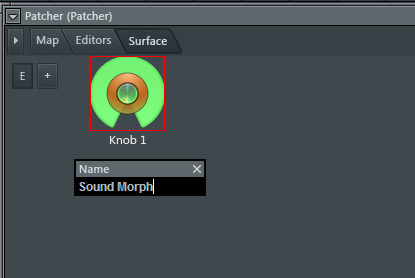 Now for one last Morph to the sound, lets link the Surface knob to a parameter in Effector and select the effect type in Effector. 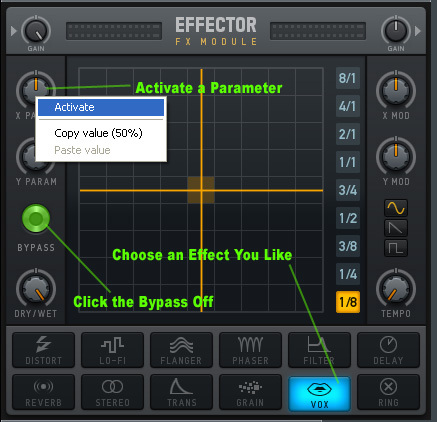 First, go to the Editors tab and to Effector and choose an Effect. Second, turn off the bypass. Finally, activate the X Param and/or Y Param. Now you can rename your Fruity Formula Controllers and Fruity Sends for better reference on your Map and Editors pages in Patcher, because the larger and more complex the Patcher preset gets, the more these references help you to remember what is going on. 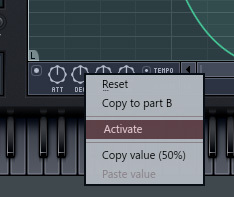 Also remember to save your preset once you get it the way you like it.